Elizabeth Rengel appeared on Show 289, recorded in April 2014, at age 17. Precipice Sax Quartet is coached by Shawn Tracy and based at the Merit School of Music in Chicago, Illinois. Its members are 18-year-old Justin Udry from Kenosha, Wisconsin; 17-year-old Lizzy Rangel from Chicago, Illinois; 18-year-old Logan Curry from Maywood, Illinois; and 17-year-old Shane Woods from Matteson, Illinois. 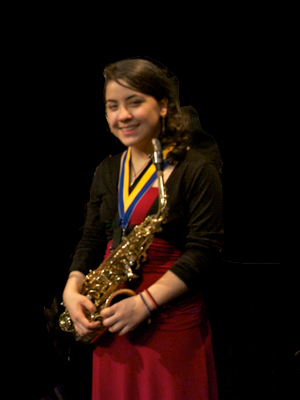 Elizabeth is a Jack Kent Cooke Young Artist.